Electronic gadgets are getting older and bolder day by day with the introduction of new launches and software. This leads to creation of a vast competition between gadget manufacturers. Mobile phones have become a necessity in today’s world. They have boosted a new revolution in communication. With the introduction of Android operating system, the consumer has moved towards smartphones leaving their old phones far apart. 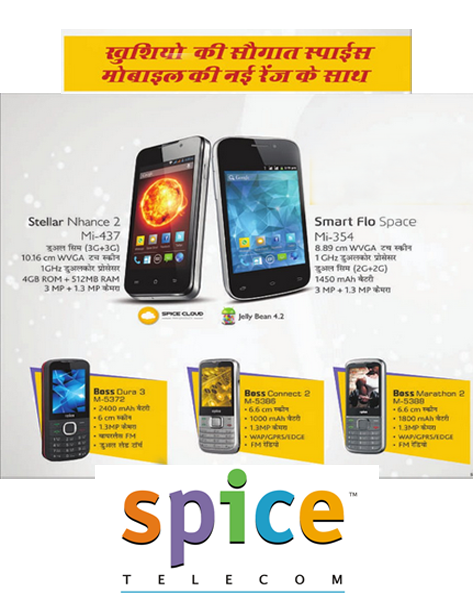 Spice mobile is one of those Indian mobile manufacturers whose products are designed in consideration with user’s requirement and budget. With their good range of existing mobiles, company has introduced their new range which includes smartphones and normal phones. The company has introduced 6 new phones out of which 4 are normal keypad phones and 2 are touchscreen smartphone. Stellar Nhance 2- Mi-437 is a 3G dual SIM smart phone which runs on 1GHz dual core processor and has primary and secondary camera. Boss Dura 3 M5372 is a camera phone which has dual LED torch, wireless FM and good battery life. Boss Connect 2- M 5386 is a camera phone which supports WAP, GPRS and Edge services. Boss Marathon 2- M 5388 supports internet facility, long battery life and camera. Boss Dura 2-M 5398 supports wireless FM and Dual LED torch. It also has a camera.